FIFA is set to relax the rules that ban teams from commemorating non-sporting events at soccer matches in response to high-profile disputes with British associations over honoring war dead. England, Northern Ireland, Scotland and Wales were fined by FIFA last year for displaying poppies at World Cup qualifying matches. World soccer’s governing body ruled that poppies flouted regulations banning political, religious or personal symbols on kit and in stadiums, leading to the British nations to push for a change. Months of talks led to FIFA distributing a circular to member associations on Friday presenting draft proposals that tighten the definition of political symbols and allow commemorations by teams to be decided on a case-by-case basis. – specific political acts or events. England and Scotland last year wore poppies on their kits for a Wembley Stadium friendly on Nov. 11 – Armistice Day – to commemorate British Commonwealth forces who have died on duty since World War I. The change to the FIFA regulations should allow England to wear poppies without fear of being sanctioned this November. England is planning to play Germany in a friendly at Wembley around Armistice Day, assuming Gareth Southgate’s side doesn’t have to contest a playoff to qualify for the World Cup. Only opposition from Germany, which is unlikely, would prevent the poppies being displayed at English soccer’s national stadium. 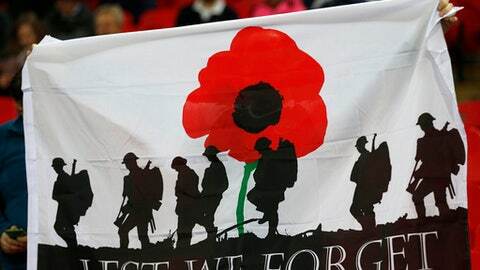 England, Northern Ireland, Scotland and Wales have been challenging their FIFA fines for last year’s war commemorations. It is unclear if FIFA would drop the sanctions once its law is changed.